Sometimes I think that Apple has forgotten that it is a computer company. I am using a five year old iBook and don't feel like Apple has produced a significant laptop to compel me to upgrade. On the other hand, in the same amount of time, Apple has released atleast ten versions of the iPod. I jumped on board with an iPod mini about two years ago and I already feel like it's outdated! 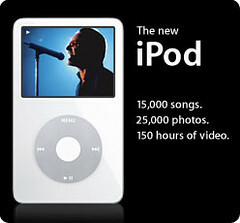 The newest release (Tuesday) is the much anticipated video iPod. While watching a movie on a 2 inch screen seems ridiculous, Apple has tried to highlight a more appropriate use of portable video. With their latest version of iTunes you can download TV shows, video podcasts and short movies. It will be interesting to see if this catches on. SInce downloading iTunes 6 this week, I have discovered the pleasure of viewing video podcasts, which are basically short video broadcasts on a variety of subjects. If my daily routines didn't place me next to a computer all the time, I would probably be very tempted to buy a video iPod. While I don't blame it for riding the wave of success with the iPod, I can only hope that Apple will put it's creative genius back into computers soon.